Periprosthetic femur fractures are a growing problem in the geriatric population. This study examines Vancouver B1 periprosthetic femur fractures treated with open reduction internal fixation using a laterally based plate. Outcomes using plates which spanned the length of the femur to the level of the femoral condyles were compared to those which did not. The hypothesis was that spanning internal fixation would result in a decreased rate of refracture and subsequent reoperation. 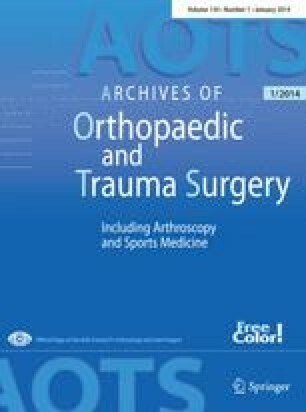 Patients admitted to three affiliated academic hospitals treated with open reduction internal fixation for a periprosthetic femur fracture in the setting of a preexisting total hip arthroplasty or hemiarthroplasty stem were identified. Patient data were reviewed for age, gender, fracture classification, operative intervention, time to union, as well as complications related to treatment and need for further surgery. Over a 5-year period, 58 patients were treated with open reduction internal fixation using a laterally based plate for Vancouver B1 femur fractures. Twenty-one patients were treated with plates that extended to the level of the femoral condyles. In that group there were no nonunions or subsequent periprosthetic fractures reported. Of 36 patients treated with short plates, 3 went on to nonunion resulting in plate failure and refracture and 2 sustained a subsequent fracture distal to the existing fixation. In this series, fixation for periprosthetic femur fractures around a well-fixed arthroplasty stem which spans the length of the femur to the level of the femoral condyles is associated with a decreased rate of nonunion and refracture. By decreasing the rate of refracture and nonunion, spanning fixation decreases the morbidity and mortality associated with additional surgery in a fragile geriatric population.